BACKGROUND: Methotrexate (MTX) is the primary disease-modifying antirheumatic drug used for the treatment of rheumatoid arthritis (RA). Optimizing the use of oral and subcutaneous MTX may delay the use of expensive biologic therapies; the effect of such a delay on overall medical costs is currently unknown. OBJECTIVE: To compare the 5-year healthcare costs of treatment pathways for patients with RA who initiate oral MTX in the United States. METHODS: We identified patients with RA in the Symphony Health Solutions database (Integrated Dataverse) who initiated treatment with oral MTX in 2009 and had RA-related claims for each year through 2014. We then grouped the patients into 4 treatment cohorts, including those who (1) continued to use oral MTX, (2) switched to subcutaneous MTX, (3) switched to subcutaneous MTX and then added or switched to a biologic therapy, and (4) added or switched to a biologic therapy. The costs (in 2015 US dollars) for pharmaceuticals, office visits, hospitalizations, and emergency department visits were estimated for each cohort. RESULTS: Of the total 35,640 patients in this study, 15,599 patients continued to use oral MTX, with an average cost of $47,464 per patient in the full study period; 1802 patients switched to subcutaneous MTX, with an average per-patient cost of $59,058; 711 patients switched to subcutaneous MTX and then added or switched to a biologic agent, with an average per-patient cost of $175,391 and a mean time to a biologic use of 1184 days; and 17,528 patients added or switched to a biologic from oral MTX, with an average per-patient cost of $212,595 and a mean time to a biologic use of 478 days. Biologic treatments were responsible for the cost differences between the cohorts; the nondrug costs were similar across the groups. CONCLUSION: Our findings that patients who switched to subcutaneous MTX incurred lower costs than patients who only used oral MTX before using biologics may provide useful information for patients and providers who are choosing between continued MTX use and adding or switching to a biologic based on treatment guidelines. Methotrexate (MTX) is the primary disease-modifying antirheumatic drug (DMARD) for the treatment of RA. The American College of Rheumatology (ACR) and the European League Against Rheumatism (EULAR) guidelines recommend MTX as the initial therapy for patients with active RA.4,5 The ACR and EULAR also recommend switching to a biologic therapy, in combination with MTX if possible, when initial treatment targets are not met. 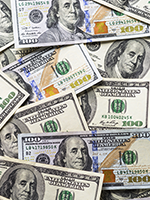 The real-world impact of subcutaneous MTX use on direct medical costs remains unknown. 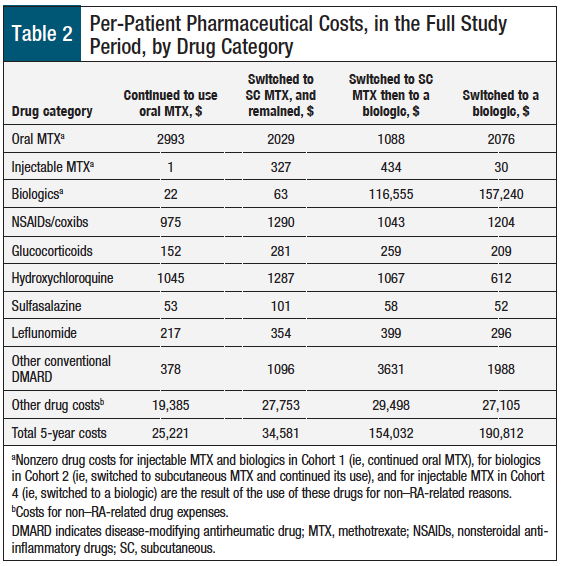 Thus, the objectives of this study were to characterize the different pharmaceutical treatment pathways for patients with RA who initiate oral MTX therapy in the United States, and to estimate the 5-year healthcare costs for patients who initiate and continue to use oral MTX exclusively; switch to subcutaneous MTX; or add or switch to a biologic therapy. This analysis is based on the Symphony Health Solutions anonymized patient-level claims data, which capture approximately 274 million US patients and 92% of all drug prescribers in the United States. We included adjudicated and nonadjudicated claims in these analyses. We selected patients who were diagnosed with RA (International Classification of Diseases, Ninth Revision [ICD-9] codes 714.0 and 714.30) in 2009 who were eligible for medical and pharmacy benefits and had at least 1 RA-related claim in each year of the study period from January 2009 through December 2014. Patients were required to have started using oral MTX at some point during 2009 without use of MTX in the previous 12 months. 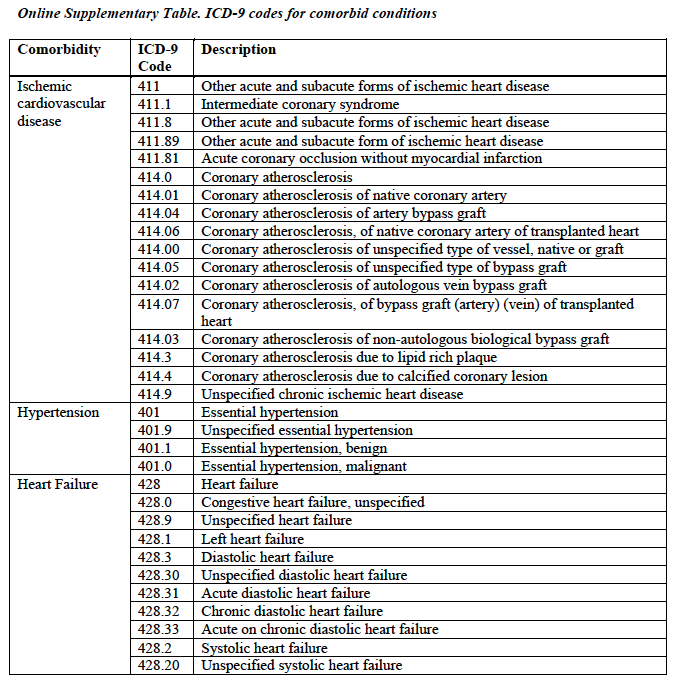 The patients’ comorbidities were defined based on the presence of an ICD-9 code submitted during any time of the study (the relevant codes are listed in the Appendix at the end of this article). Patients who started oral MTX therapy were classified into 4 treatment cohorts that included those who (1) continued to use oral MTX, (2) switched to subcutaneous MTX, (3) switched to subcutaneous MTX and then added or switched to a biologic therapy, or (4) added or switched to a biologic therapy from oral MTX. 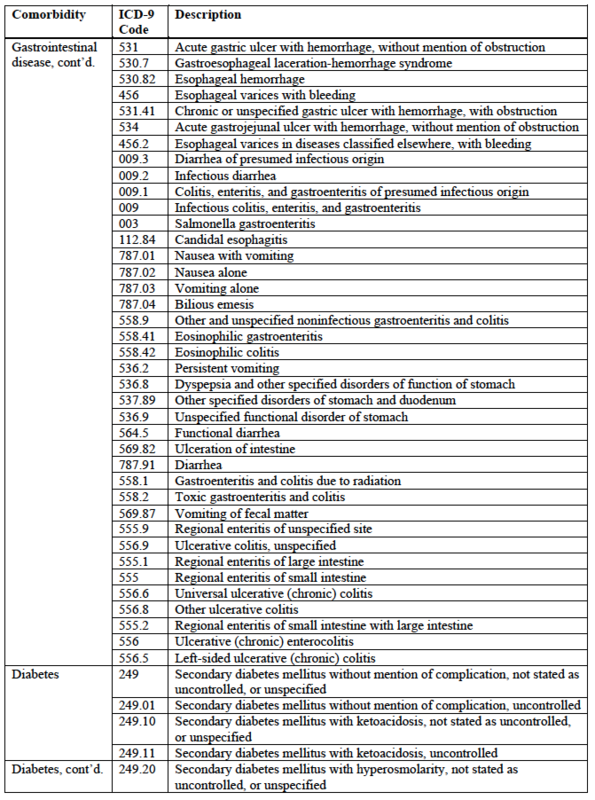 The claims for patients in each cohort were then aggregated by code to form the dataset for the analysis. The claims from the Symphony Health Solutions database had detailed utilization data, but they did not contain cost information or paid amounts. We therefore linked the appropriate code in each claim to external sources to obtain cost information (in 2015 US dollars). Claims covered all healthcare services, not only those related to RA. Hospitalization costs were calculated by applying each hospitalization’s diagnosis-related group (DRG)­specific relative weight to the sum of the national base labor ($3753.31), nonlabor ($1639.38), and capital ($434.26) cost components obtained from CMS.22,23 DRG codes were not provided in the Symphony Health Solutions data; we derived them from diagnosis codes and procedure codes using general equivalent mappings, which were also obtained from CMS.24 Nonadjudicated claims were included in these analyses. The costs of each emergency department encounter were calculated as the sum of the costs of each encounter’s procedures. 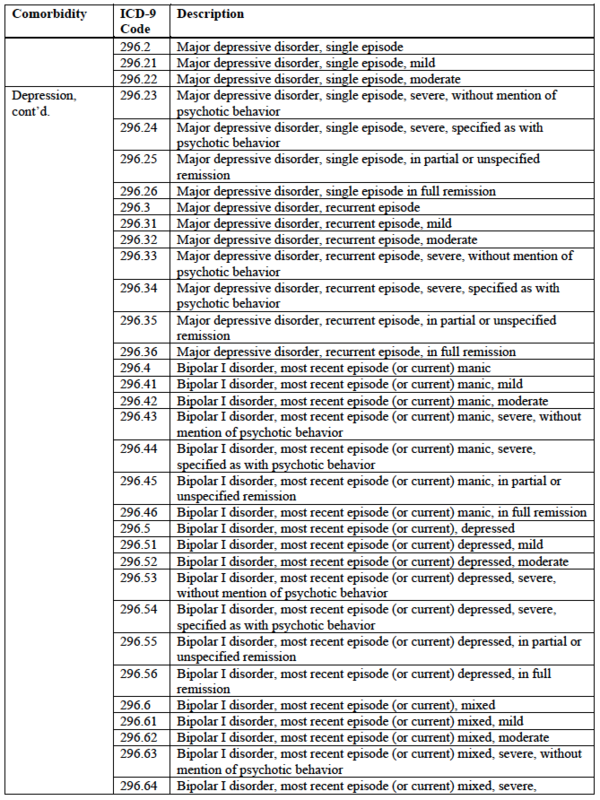 Procedure costs were obtained from the CMS ambulatory payment classification (APC) Hospital Outpatient PPS October 2015 Addendum B file.25 APC codes were not included in the Symphony Health Solutions data; we derived the APC codes by matching the descriptions of the HCPCS codes in the Addendum A file to the APC code descriptions. 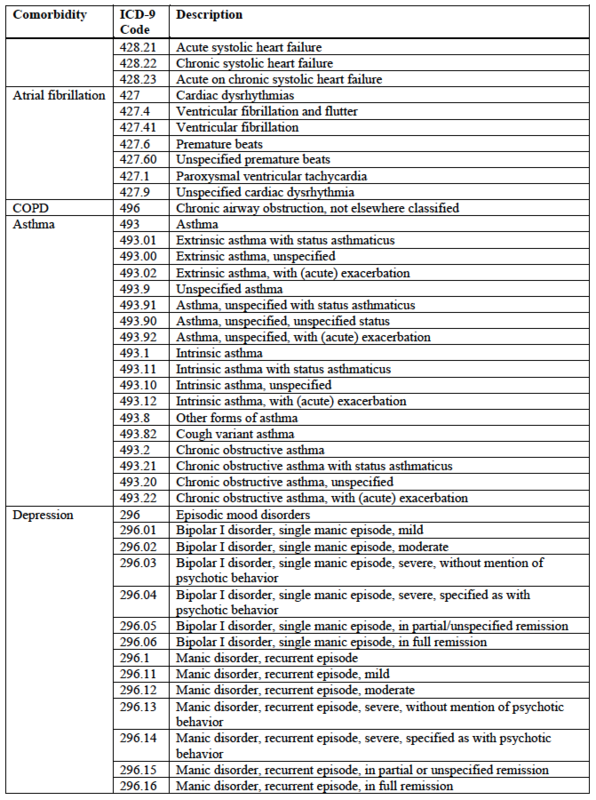 Because the prescription dataset lacked diagnosis codes, we considered a pharmaceutical drug to be related to RA if its National Drug Code matched the list of DMARDs found in the Healthcare Effectiveness Data and Information Set Disease-Modifying Antirheumatic Drug Therapy for Rheumatoid Arthritis (ART)-C file.27 MTX was categorized by oral or injectable (subcutaneous) route of administration. The background demographic characteristics for each cohort were summarized by their means, medians, standard deviations, ranges, and proportions. The total costs were calculated based on aggregated claim counts in each category (office-based, hospitalizations, emergency department, and pharmaceutical). Per-patient costs were calculated by dividing the total costs by the number of patients in each cohort. We identified 35,640 patients who started using oral MTX in 2009 (Figure 1). The majority of these patients used either oral MTX alone (44%) through 2014 or added or switched to a biologic agent from oral MTX (49%). The 7% remaining patients used subcutaneous MTX in some manner: 75% switched to and continued to receive subcutaneous MTX (5%), and 25% switched to subcutaneous MTX before adding or switching to a biologic agent (2%). 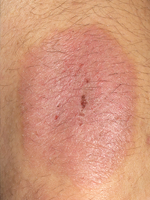 The use of subcutaneous MTX was associated with the delayed use of a biologic therapy. Patients who switched to subcutaneous MTX initiated biologic therapy, on average, 706 days later than patients who did not use subcutaneous MTX (mean of 1184 days vs 478 days from the start of oral MTX to the start of a biologic therapy among those who eventually initiated a biologic therapy). Patient demographic and baseline characteristics were broadly similar across the cohorts (Table 1). The patients who continued to use oral MTX tended to be older than those in the other cohorts, and the patients who switched to subcutaneous MTX were more likely to be women. Table 2 shows the total 5-year per-patient pharmaceutical costs by treatment cohort. In ascending order, the per-patient pharmaceutical costs were $25,221 for patients who continued to use oral MTX, $34,581 for patients who switched to and continued using subcutaneous MTX, $154,032 for patients who switched to subcutaneous MTX and then added or switched to a biologic, and $190,812 for patients who added or switched to a biologic directly after oral MTX. The total 5-year pharmaceutical costs for patients who switched to biologics were 4 to 8 times higher than the costs of patients who continued to use oral or subcutaneous MTX. RA-related drug costs accounted for 20% to 25% of total drug costs for patients who used only oral or subcutaneous MTX. In contrast, the RA-related drug costs accounted for 80% to 85% of the total drug costs for patients who eventually started biologic therapies. Patients who eventually started a biologic therapy had much higher RA-related drug costs than the other patients in this study. However, patients who switched to subcutaneous MTX before adding or switching to a biologic therapy incurred lower costs than those who added or switched to a biologic therapy directly after oral MTX. Table 3 shows the per-patient medical expenditures by place of service in the full study period. Patients who used biologics tended to have higher office visit costs and lower hospitalization costs than patients who continued to use oral or subcutaneous MTX. Overall, the total nonpharmaceutical costs were similar across the cohorts, ranging from $21,359 (patients who switched to subcutaneous MTX and then to a biologic) to $24,477 (patients who switched to subcutaneous MTX), indicating that patients received similar underlying care despite using different treatments for their RA. Table 3 and Figure 2 show the total per-patient costs for each cohort for the full study period. 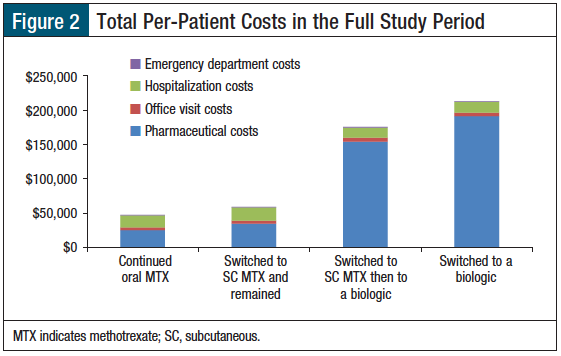 The patients who continued to use oral MTX incurred the lowest per-patient costs, followed by patients who switched to subcutaneous MTX and continued the drug, patients who switched to subcutaneous and then added or switched to a biologic, and patients who switched to a biologic from oral MTX. Total costs were 3 to 4 times higher for patients who added or switched to a biologic than patients who continued to take oral or subcutaneous MTX. Table 4 and Figure 3 show the total costs for each cohort in the full study period. 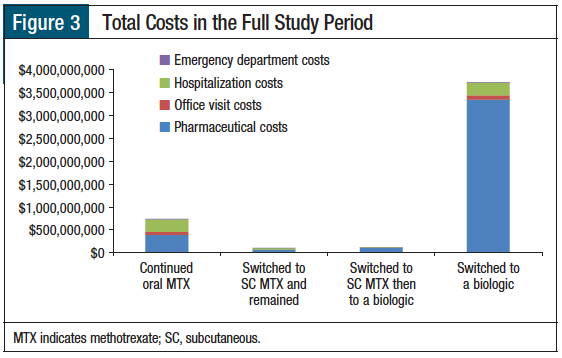 Patients who continued to use oral or subcutaneous MTX were underrepresented in overall costs in relation to their proportion of the study sample. 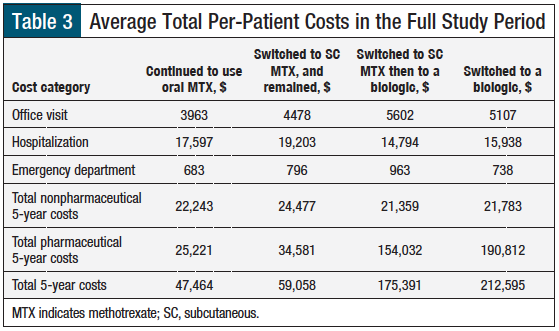 Patients who continued to use oral MTX represented 44% of the sample, but only 15.7% of all of the costs; patients who continued to use subcutaneous MTX represented 5% of the sample, but only 2.3% of all of the costs. Conversely, patients who added or switched to a biologic therapy were overrepresented in the overall costs; the patients who switched to subcutaneous MTX before adding or switching to a biologic therapy represented 2% of the sample and 2.7% of all costs, whereas patients who switched to biologics directly from oral MTX represented 49% of the sample and 79.3% of all costs. We used a large, nationally representative sample of patients with RA to analyze their healthcare utilization patterns for 5 years. We found that patients who continued to use oral or subcutaneous MTX incurred much lower total per-person medical costs during the 5-year study period than patients who added or switched to biologic therapies. The use of biologics was responsible for this cost difference (office-based, hospital, and emergency department costs were similar across the cohorts). 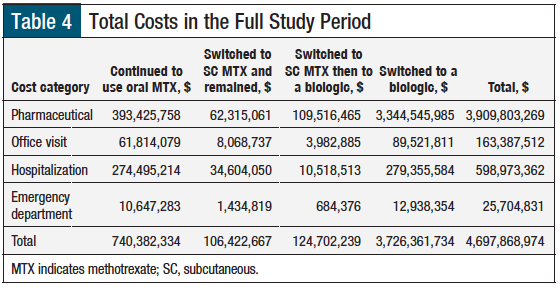 We also found that among patients who switched to biologics, those who switched to subcutaneous MTX and then added or switched to a biologic incurred lower total per-person medical costs than those who switched directly from oral MTX to a biologic. 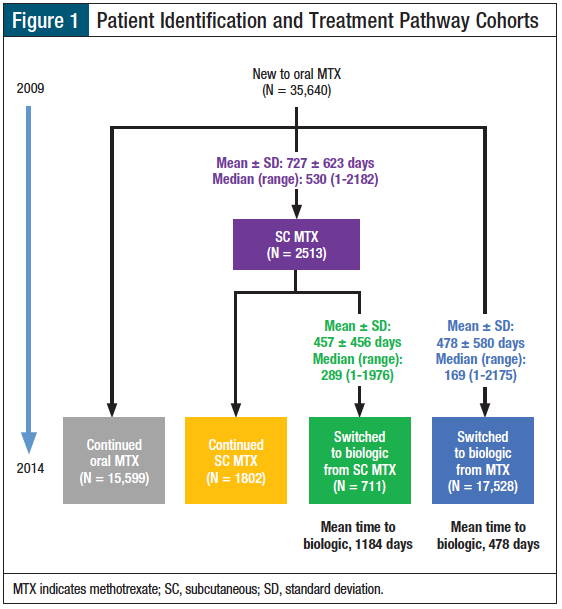 The cost difference is largely attributable to intermediate subcutaneous MTX treatment that delayed the use of expensive biologics—mean time to the use of a biologic was 1184 days after switching from subcutaneous MTX versus 478 days when switching directly from oral MTX (Figure 1). This study has several limitations. We only had access to aggregated claim counts and costs for each cohort. Without individual-level claims data, we were unable to adjust for differences in a patient baseline characteristics or to estimate costs stratified by patient characteristics, such as age. In addition, we did not have access to reimbursed costs. Imputing costs based on CMS fee schedules and average wholesale prices provides a standardized cost reference, but these costs are higher than the actual costs incurred after adjustments have been made for claim denials and for drug rebates. Finally, because this analysis is based on claims data, we did not have data on patients’ RA severity, response to therapy, or clinical outcomes, which prevented an analysis of patient channeling bias between cohorts. MTX is the preferred initial DMARD recommended by international RA treatment guidelines. The findings of this study suggest that increasing the use of oral or subcutaneous MTX in appropriate patients can shift patients from higher-cost treatment pathways to lower-cost treatment pathways. Avoiding or delaying the use of expensive biologic therapies for this patient population will alter the cost distribution and may reduce the economic burden of RA on the US healthcare system. Because RA is a chronic disease, more research is needed to understand the long-term costs and clinical benefits of RA treatment patterns in the United States. This study was funded by Medac Pharma. Dr Lee, Mr Pelkey, and Dr Ganz are employees of Evidera, which received funding from Medac Pharma; Ms Gubitosa is an employee of Symphony Health Solutions, which received funding from Medac Pharma; and Mr Henrick is an employee of Medac Pharma. Dr Lee is Statistician, Evidera, San Francisco, CA; Mr Pelkey is Research Associate, Evidera, San Francisco; Ms Gubitosa is Senior Consultant, Commercial Effectiveness, Symphony Health Solutions, Conshohocken, PA; Mr Henrick is Associate Director of Sales Operations, Medac Pharma, Chicago, IL; Dr Ganz is Senior Research Scientist, Evidera, Waltham, MA. 1. Helmick CG, Felson DT, Lawrence RC, et al; for the National Arthritis Data Workgroup. 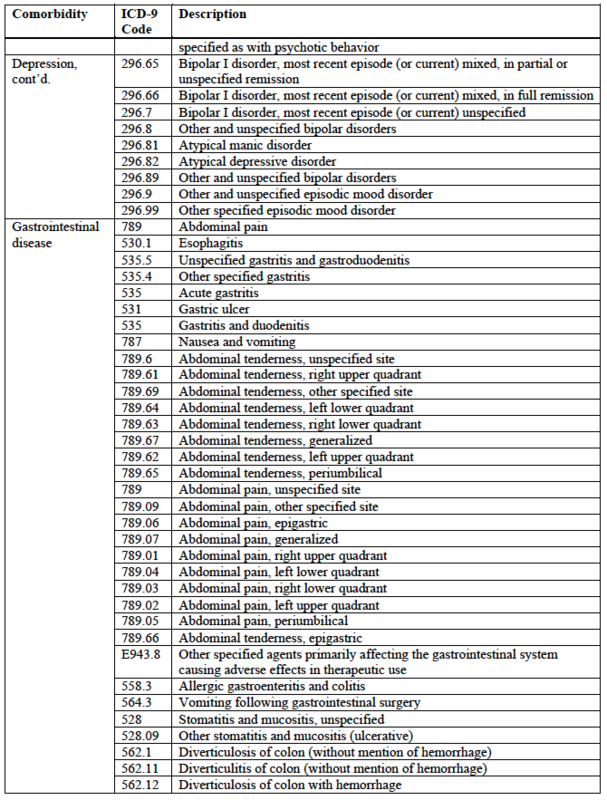 Estimates of the prevalence of arthritis and other rheumatic conditions in the United States: part I. Arthritis Rheum. 2008;58:15-25. 2. Matcham F, Scott IC, Rayner L, et al. The impact of rheumatoid arthritis on quality-of-life assessed using the SF-36: a systematic review and meta-analysis. Semin Arthritis Rheum. 2014;44:123-130. 3. Kawatkar AA, Jacobsen SJ, Levy GD, et al. Direct medical expenditure associated with rheumatoid arthritis in a nationally representative sample from the Medical Expenditure Panel Survey. Arthritis Care Res (Hoboken). 2012;64:1649-1656. 4. Singh JA, Saag KG, Bridges SL Jr, et al. 2015 American College of Rheumatology guideline for the treatment of rheumatoid arthritis. Arthritis Rheumatol. 2016;68:1-26. 5. Smolen JS, Landewé R, Breedveld FC, et al. EULAR recommendations for the management of rheumatoid arthritis with synthetic and biological disease-modifying antirheumatic drugs: 2013 update. Ann Rheum Dis. 2014;73:492-509. 6. Yelin E, Wanke LA. An assessment of the annual and long-term direct costs of rheumatoid arthritis: the impact of poor function and functional decline. Arthritis Rheum. 1999;42:1209-1218. 7. Cooper NJ. 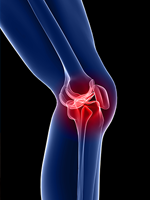 Economic burden of rheumatoid arthritis: a systematic review. Rheumatology (Oxford). 2000;39:28-33. 8. Bianchi G, Caporali R, Todoerti M, Mattana P. Methotrexate and rheumatoid arthritis: current evidence regarding subcutaneous versus oral routes of administration. Adv Ther. 2016;33:369-378. 9. Braun J, Kästner P, Flaxenberg P, et al; for the MC-MTX.6/RH Study Group. Comparison of the clinical efficacy and safety of subcutaneous versus oral administration of methotrexate in patients with active rheumatoid arthritis: results of a six-month, multicenter, randomized, double-blind, controlled, phase IV trial. Arthritis Rheum. 2008;58:73-81. 10. Jay R. Methotrexate revisited: considerations for subcutaneous administration in RA. Clin Rheumatol. 2015;34:201-205. 11. Curtis JR, Zhang J, Xie F, et al. Use of oral and subcutaneous methotrexate in rheumatoid arthritis patients in the United States. Arthritis Care Res (Hoboken). 2014;66:1604-1611. 12. Rohr MK, Mikuls TR, Cohen SB, et al. The underuse of methotrexate in the treatment of RA: a national analysis of prescribing practices in the U.S. Arthritis Care Res (Hoboken). 2016 Nov 18 [Epub head of print]. 13. Schiff M, Jaffe J, Freundlich B, Madsen P. New autoinjector technology for the delivery of subcutaneous methotrexate in the treatment of rheumatoid arthritis. Expert Rev Med Devices. 2014;11:447-455. 14. Sharma P, Scott DG. Optimizing methotrexate treatment in rheumatoid arthritis: the case for subcutaneous methotrexate prior to biologics. Drugs. 2015;75:1953-1956. 15. Rasuvo (methotrexate) injection, for subcutaneous use [prescribing information]. Chicago, IL: Medac Pharma; November 2014. http://cdn.rasuvo.com/assets/pdf/Prescribing-Information-current.pdf. Accessed October 2, 2015. 16. Otrexup (methotrexate) injection, for subcutaneous use [prescribing information]. Ewing, NJ: Antares Pharma; March 2016. www.otrexup.com/files/7814/6112/8269/PrescribingInformation.pdf. Accessed May 4, 2016. 17. Fitzpatrick R, Scott DG, Keary I. Cost-minimisation analysis of subcutaneous methotrexate versus biologic therapy for the treatment of patients with rheumatoid arthritis who have had an insufficient response or intolerance to oral methotrexate. Clin Rheumatol. 2013;32:1605-1612. 18. Centers for Medicare & Medicaid Services. 2015 Clinical diagnostic laboratory fee schedule. File 15CLAB. 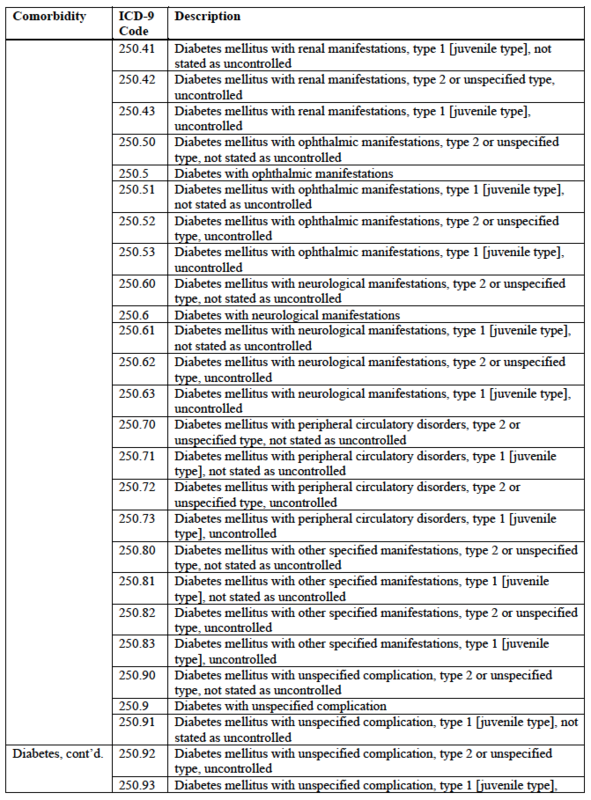 Revised January 2015. www.cms.gov/Medicare/Medicare-Fee-for-Service-Payment/ClinicalLabFeeSched/Clinical-Laboratory-Fee-Schedule-Files-Items/15CLAB.html?DLPage=1&DLEntries=10&DLSort=2&DLSortDir=descending. Accessed October 2, 2015. 19. Centers for Medicare & Medicaid Services. Durable medical equipment, prosthetics, orthotics, and supplies (DMEPOS) October 2015 fee schedule. 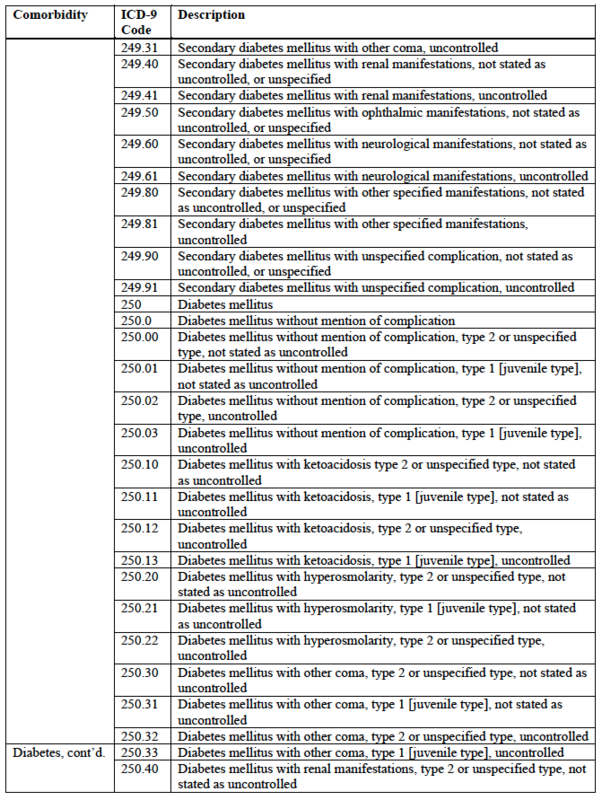 File DME15-D. Revised October 2015. www.cms.gov/Medicare/Medicare-Fee-for-Service-Payment/DMEPOSFeeSched/DMEPOS-Fee-Schedule-Items/DME15-D.html?DLPage=1&DLEntries=10&DLSort=2&DLSortDir=descending. Accessed October 2, 2015. 20. Centers for Medicare & Medicaid Services. Ambulance fee schedule public use file CY 2015. www.cms.gov/Medicare/Medicare-Fee-for-Service-Payment/AmbulanceFeeSchedule/afspuf.html. Accessed October 2, 2015. 21. Centers for Medicare & Medicaid Services. 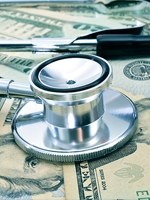 Physician fee schedule search: 2015B. www.cms.gov/apps/physician-fee-schedule/search/search-criteria.aspx. Accessed October 2, 2015. 22. Centers for Medicare & Medicaid Services. Table 1A-1E (Final Rule and Correction Notice). FY 2015 Final Rule tables. Acute inpatient prospective payment system. 2015. www.cms.gov/Medicare/Medicare-Fee-for-Service-Payment/AcuteInpatientPPS/FY2015-IPPS-Final-Rule-Home-Page-Items/FY2015-Final-Rule-Tables.html. Accessed October 2, 2015. 23. Centers for Medicare & Medicaid Services. Table 5 (Final Rule and Correction Notice). FY 2015 Final Rule tables. Acute inpatient prospective payment system. 2015. www.cms.gov/Medicare/Medicare-Fee-for-Service-Payment/AcuteInpatientPPS/FY2015-IPPS-Final-Rule-Home-Page-Items/FY2015-Final-Rule-Tables.html. Accessed October 2, 2015. 24. Centers for Medicare & Medicaid Services. 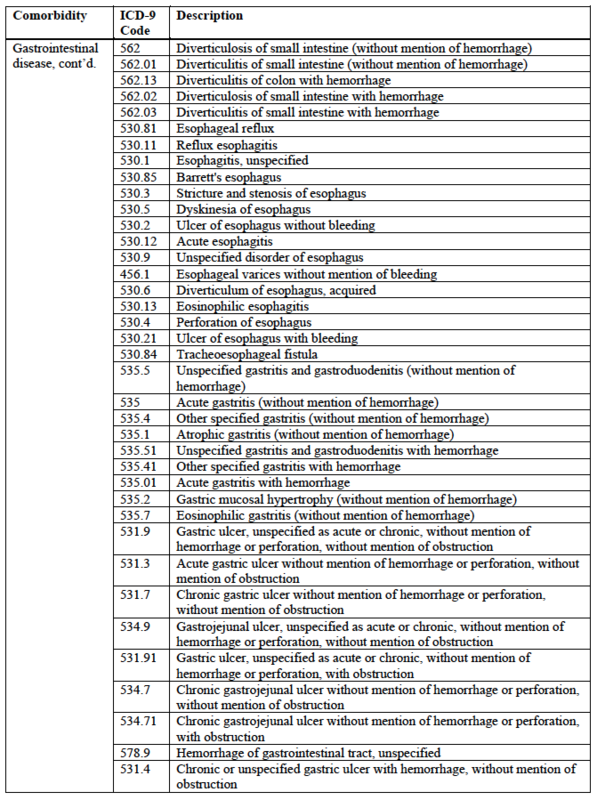 2015 ICD-10-CM and GEMs. www.cms.gov/medicare/coding/icd10/2015-icd-10-cm-and-gems.html. Accessed October 2, 2015. 25. Centers for Medicare & Medicaid Services. Ambulatory payment classification (APC) hospital outpatient PPS: Addendum A and addendum B updates. 2015. www.cms.gov/Medicare/Medicare-Fee-for-Service-Payment/HospitalOutpatientPPS/Addendum-A-and-Addendum-B-Updates.html. Accessed October 2, 2015. 26. Centers for Medicare & Medicaid Services. October 2015 ASP Pricing file. 2015. www.cms.gov/Medicare/Medicare-Fee-for-Service-Part-B-Drugs/McrPartBDrugAvgSalesPrice/2015ASPFiles.html. Accessed October 2, 2015. 27. National Committee for Quality Assurance. Table ART-C: DMARDs. HEDIS 2015 final NDC lists. 2015. www.ncqa.org/hedis-quality-measurement/hedis-measures/hedis-2015/hedis-2015-ndc-license/hedis-2015-final-ndc-lists. Accessed October 2, 2015.
published in American Health & Drug Benefits in February 2017. One reason for this aggressive treatment approach is that remission in established RA is difficult to achieve. Physicians, therefore, focus heavily on achieving remission as early as possible.1 Although methotrexate is often recommended as a preferred first-line therapy as described in this issue by Lee and colleagues,3 many physicians prefer to have relatively open access to a selection of drugs that will aggressively manage the individual patient to reduce joint damage and other systemic effects that result from untreated or undertreated RA. The challenge for payers is compounded by the patient’s response to treatment. Although only 10% to 20% of patients with established RA will achieve disease remission, for patients with early-stage RA (between 6 months and 1 year), remission rates range between 30% and 40%.1 As noted above, because of the high incidence of the disease, the associated disability, and the progressive nature of RA,1 it is critically important to quickly identify and implement clinically favorable and cost­effective treatments that are focused on preventing disease progression and improving patients’ quality of life. The study by Lee and colleagues demonstrates that the use of oral or subcutaneous methotrexate that is optimized according to the guidelines can be a financially appealing medication option,3 but this drug does not successfully address the patient’s systemic condition. Because RA is a progressive and debilitating disorder, addressing the patient’s RA-related systemic effects does more than relieve pain and improve the patient’s quality of life—it slows joint damage with the goal of helping patients to maintain productivity and avoid severe disability over time. 1. Reinke T. Aiming at a moving target in rheumatoid arthritis. Manag Care. 2013;22:23-26. 2. Singh JA, Furst DE, Bharat A, et al. 2012 Update of the 2008 American College of Rheumatology recommendations for the use of disease-modifying antirheumatic drugs and biologic agents in the treatment of rheumatoid arthritis. Arthritis Care Res (Hoboken). 2012;64:625-639. 3. Lee J, Pelkey R, Gubitosa J, et al. Comparing healthcare costs associated with oral and subcutaneous methotrexate or biologic therapy for rheumatoid arthritis in the United States. Am Health Drug Benefits. 2017;10(1):42-49. 4. Owens GM. Managed care implications in managing rheumatoid arthritis. Am J Manag Care. 2014;20(7 suppl):S145-S152.